What does the gas deal between Russia and China mean? President Putin has done it again: he’s beaten President Obama at his own game. This time the name of the game is “pivot to Asia”. And while the US is stuck between Eastern Europe and the Middle East, Russia has swung smoothly to China. It took 10 years but the reward may be worth every minute of the wait, or rather hard work. It started in 2004 with negotiations to supply Russian gas to China. An understanding was reached some time ago, but the stumbling block was the price. President Putin, who witnessed the historic signing in Shanghai last Wednesday, said the Chinese were really tough negotiators. Konstantin Simonov, director of the National Energy Security Fund (NESF), said China understood the political importance of the gas contract to Russia and was haggling hard. Russia wanted to prove to its western partners that it has alternative markets for gas; but China was equally interested in the contract because it needs gas for its eastern industrial regions that can’t get enough of from Central Asia. Aware of the growing environmental and health costs of using cheap local coal, China is switching to cleaner gas to fire its industries and is poised to become the largest gas consumer in the world. The Chinese national petrol and gas company CNPC denies it tried to take advantage of Russia’s difficulties with the EU to bring down the price of Russian gas. It named its price long before the current talk of western sanctions against Russia. But the timing of the deal has added to its significance. It may well be a game-changer in the history of the Russian/Soviet gas industry, traditionally pivoted towards Europe. More than a trillion cubic metres of Russian gas worth $400bn (£237bn) will flow in the opposite direction over the next 30 years. On the news of the deal, Gazprom shares rose nearly 2pc. The agreed price was not disclosed but is believed to be on a par with what Western Europe pays. Because of the underdeveloped pipeline infrastructure in Siberia there will be an extra cost of building supply lines. The two countries will need to invest about $75bn (£45bn) in building this infrastructure. To some commentators, it’s a high price to pay for the diversification of Russia’s gas exports; to others it’s a perfect development opportunity for a neglected part of Russia. Other Russian offers to China include a stake in Gazprom’s Vladivostok liquefied natural gas terminal and more shares for CNPC in oil giant Rosneft. These deals, still to be agreed, would make China more than an export destination for Russian commodities, Stratfor analysts believe. •Building bridges and transport links across the Russian-Chinese border to cut travel distances for goods and people by hundreds of miles. To finance the projects, the countries have agreed to make more use of their national currencies rather than the dollar. 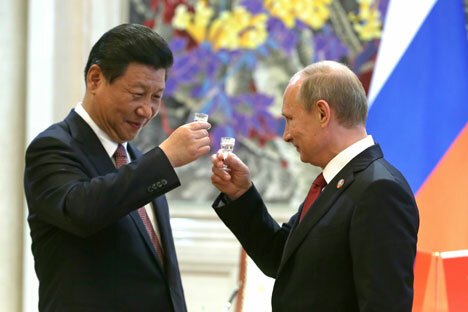 China is already giving loans to Rosneft in roubles. According to Mr Putin, the overall volume of Sino-Russian deals to finance by 2020 is worth more than $200bn. So have western worries about Russia siding with China become a self-fulfilling prophesy? Sergei Luzyanin of the Moscow Institute of International Relations believes the deals enhance a new pivot of power in the world. China, he says, having adopted a neutral position on Ukraine, in effect supports Moscow. Professor Luzyanin calls this a “friendly neutrality” that makes western sanctions less of a problem. “But not for Western Europe”, argues Russian energy minister Aleksandr Novak. “Without Russian gas supplies, Europe would not be able to provide for its energy needs,” he says. Mr Novak predicts that by 2020 Europe’s gas production will shrink by 20pc. Combined with the reduction in Russian gas supplies, this may significantly increase the price of gas for Europeans. Qatar is already shifting exports from Europe to Asia, where the price is much higher. And when producers in the US start exporting gas, they would be tempted to sell it to Asia, too. No one would be willing to subsidise gas for Europe. The energy deal does not mean Beijing and Moscow are aligned politically, say Stratfor analysts. But each country has a use for the other, and their partnership could help ensure domestic stability and enhance their positions in the world. Prof Luzyanin believes China may eventually go from “friendly neutrality” towards more open support of Russia, but only if President Obama continues his policy of the containment of China in her territorial disputes with Japan and other neighbours. If this policy translates into some kind of “Asian Nato”, says Prof Luzyanin, China will be tempted to improve its strategic partnership with Russia. Prof Luzyanin does not expect a military alliance to be formed, but believes the Sino-Russian Partnership Treaty of 2001 may be upgraded to reflect the new realities. China’s ambitions go well beyond a strategic partnership with any one country. Its grandiose project of a new Silk Road involves dozens of countries en route from Europe to China. But with the impending withdrawal of western forces, Afghanistan could become the weakest link in this endeavour, says Prof Luzyanin, and China would need Russian help here as well. In 1972, President Nixon’s diplomacy coup in China was a game-changer in the international arena. President Obama’s pivot-to-Asia initiative was designed to repeat that achievement. Explaining President Obama’s pivot to Asia, American experts on the subject Kurt Campbell and Brian Andrews list a host of powers, well-established and emerging, which Washington is trying to engage in “building diplomatic, economic, people-to-people and security ties” in the Asia-Pacific Region. One country which is conspicuously absent from this list is Russia, a major Asia-Pacific power that has just become more pivotal to the future of the region. Will the US-Asian pivot work smoothly without it?